Protect the things important to you! Anti loss alarms are gaining popularity for the simple reason that many of us have misplaced something of value at one time or another. Electronic loss prevention alarms provide added protection and the peace of mind that you will not misplace your valuables. Protect a wide range of items from laptops and briefcases, to data sticks and car keys. 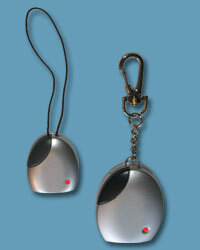 The Security Alarm consists of a Transmitter and signal Receiver. When the two units become separated beyond the preset distance, the Receiver starts to beep and vibrate until the Transmitter is back in range. Keep your family safe and never forget your cellphone, purse or backpack again! Available in SILVER, LIGHT BLUE and PURPLE. See how to use THEFT GUARD ALARM INSTRUCTIONS page. An easy solution to ensure you are never separated from the things you cherish. 1. Child Safety Alarm - Attach the transmitter (smaller unit) to your child or pet and the alarm will sound if they wander from inside your safety limits. Distance can be preset between 0 and 50 feet. 2. Wireless Reminder - Protect musical instruments, cameras and camcorders, kids electronic games, or any other valuable property that can be left in your car, taxi, subway or hotel room. 3. Luggage Protector - A security device for bags, suitcases and luggage in general, which allows you to monitor your belongings at all times, and reduces the risk of them being lost or stolen.